Business Espionage: Risk, Threats, and Countermeasures provides the best practices needed to protect a company's most sensitive information. It takes a proactive approach, explaining the measures and countermeasures that can be enacted to identify both threats and weaknesses. The text fully explains the threat landscape, showing not only how spies operate, but how they can be detected. Drawn from the author’s 40 years of experience, this vital resource will give readers a true understanding of the threat of business spying and what businesses can do to protect themselves. 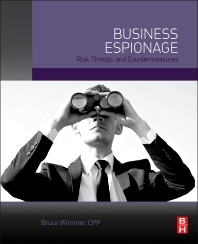 It is ideal for use as a tool to educate staff on the seriousness of the threat of business espionage. Corporate security directors and managers, business managers, risk managers, corporate security consultants, and students in two- and four-year business administration and security management programs. Bruce Wimmer has been involved in investigations and security consulting for more than 42 years. He served for nearly 22 years in the U.S. Air Force, briefly as an intelligence officer and the majority of that time as a special agent with the Office of Special Investigations (OSI). He has also spent nearly 20 years in corporate security and investigations, mostly with various divisions of Pinkerton. During his long career, he has conducted and supervised thousands of investigations and security consulting projects around the world. Mr. Wimmer has worked in more than 50 countries and in every state within the United States. He has lived abroad for 18 years and has worked in Asia, the Near East, Europe, the Caribbean, Latin America, and even on the Polar Ice Cap. He has special expertise in countering business espionage. During his time with the Department of Defense, he was cited for developing the best and most comprehensive counterespionage education and awareness program in the entire U.S. Air Force. He was also cited for having the largest actual espionage investigations caseload in the entire U.S. Air Force while in Berlin. He was responsible for the neutralization of multiple internal Air Force spies. He has also been responsible for a number of counterespionage operations that were publicly disclosed and a far larger number that have remained classified and sensitive. He has spoken on the espionage threat and countermeasures around the world, and represented the U.S. military as the nation’s official speaker at a North Atlantic Treaty Organization Counterespionage Conference. Mr. Wimmer was also responsible for the Air Force counterespionage programs in Japan and Korea, and was the head of counterespionage operations in Berlin, Germany before, during, and after the fall of the infamous Berlin Wall. He also was responsible for overseeing the Air Force counterespionage program in the entire Western Hemisphere, including the United States, Canada, and all of Latin America. In the business arena, Mr. Wimmer has assisted some of the largest companies in the world, as well as some of the smallest companies – all with sensitive business information -- in protecting their trade secrets and sensitive data from business espionage threats. He has lived and worked behind the “Iron Curtain” in what was then East Germany, as well as in Vietnam and the People’s Republic of China. He has worked at protecting secrets in 20 out of the top 25 highest risk locations in the world for business espionage. Mr. Wimmer has been designated a Certified Protection Professional (CPP) by ASIS International, has served as an officer in multiple chapters globally, and is a regular speaker at the organization’s annual convention. He was the founding chairman of Taiwan’s ASIS chapter. He is certified in Homeland Security (Level III) with the America College of Forensic Examiners Institute and is also is certified both as an operative and a trainer in the Sandia Laboratory’s Risk Assessment Methodology. He is also a member of the Espionage Research Institute International. A recognized expert on security and investigative matters, Mr. Wimmer has spoken internationally on business espionage as well as international terrorism, crisis management planning, travel security and dealing with business fraud, purchasing fraud and kickbacks. He has appeared on CNN, CNBC, National Public Radio, ABC/Discovery Channel, as well as television and radio in Taiwan, Pakistan, and Hong Kong. He has been interviewed by such international publications as Newsweek, Business Week, the International Herald Tribune, USA Today and many regional daily newspapers/media.